We believe everyone has a voice in this movement, and it's on all of us to work together to create lasting change. We have organized online action campaigns to empower people across America to ask their elected officials to take action to address workplace sexual harassment. This year, Congress made history by enacting the Congressional Accountability Reform Act to improve Congress's procedures for handling sexual harassment complaints . This is a monumental step in the right direction and represents real progress towards creating lasting change out of the #MeToo movement. But this is only the beginning: now that Congress has made progress on cleaning up its own house, we need federal lawmakers to turn to addressing the issue across American workplaces. The Purple Campaign was an active partner in pushing for the reform of sexual assault and harassment policies in Congress and workplaces across the country. Our action campaign on Congress's #MeToo bill — the Congressional Accountability Reform Act (CAA) — provided people everywhere with digital tools and suggested content to ask their officials to support the bill. After months of stalled negotiations, Congress finally took action because people like us took action first -- but it wasn't easy. Learn how we pushed Congress to pass the CAA below. 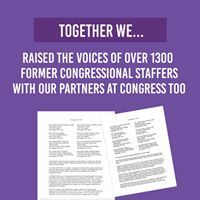 Together with our partners at Congress Too, we organized former Congressional staffers to sign a letter addressed to Senate leadership urging reform. 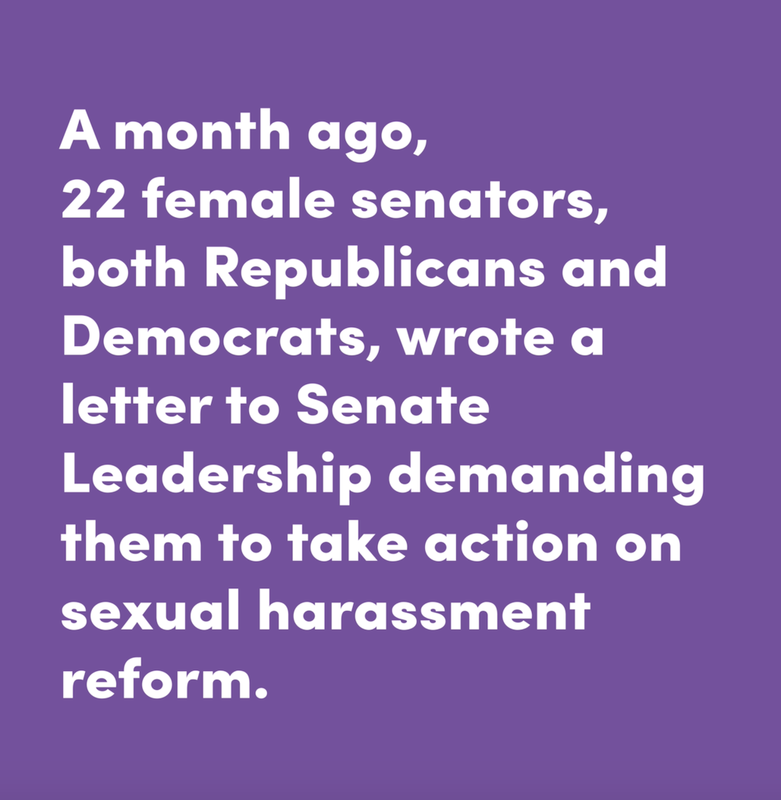 As a former Congressional staffer, Purple Campaign President Ally Coll joined over 1300 of her fellow former Hill staffers in asking the Senate to make long overdue changes to the way Congress handles sexual harassment. The letter was delivered to Senate Leadership on April 12th. 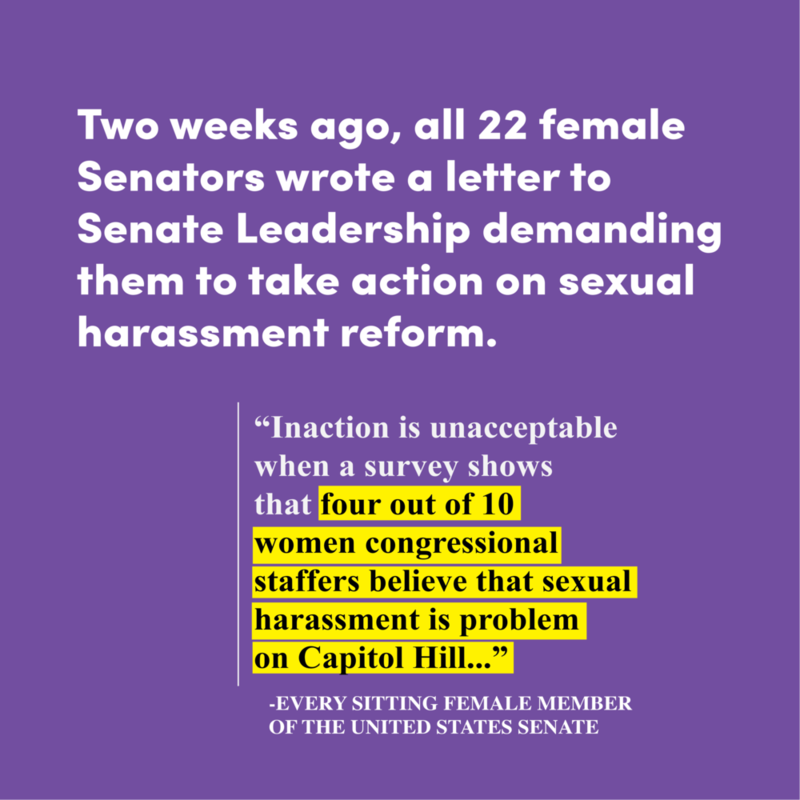 After delivering the Congress Too letter to Senate Leadership, we then people across America to make their voices heard in the fight to end workplace sexual harassment. 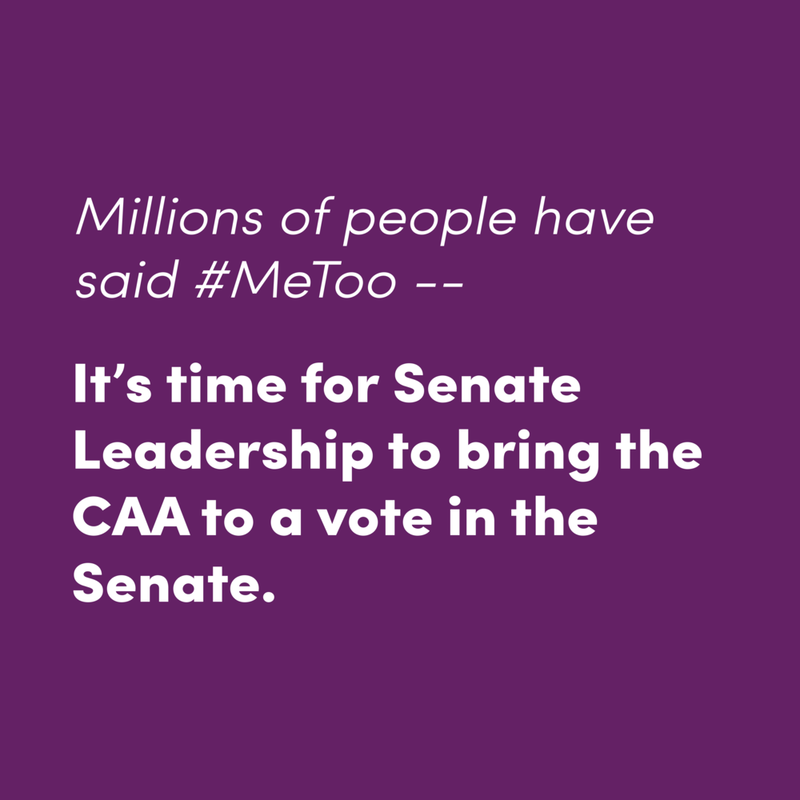 Through our new online action tool, we empowered our supporters to tweet at Senate Leadership to bring the CAA up for a vote. As of May 2nd, 43 members of the Senate had not yet supported a measure to address sexual harassment reform in Congress. Using our online action tool, our supporters tweeted at Senate Leadership & the 43 remaining members of the Senate to support #CAANow. Through this advocacy, we helped make clear that ending workplace sexual harassment shouldn't be seen as a partisan issue. After over three months of stalled negotiations, Purple Campaign President Ally Coll discussed her own sexual harassment experience on national television, urging Congress to make things better for the next generation of women. Watch the full video here. 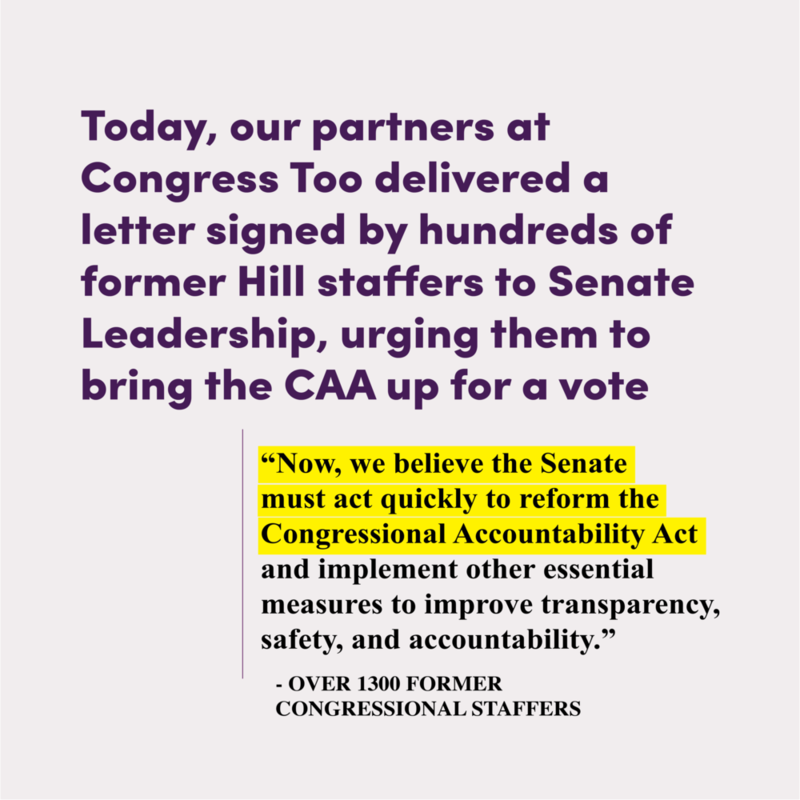 When 100 days had passed since the House unanimously passed the CAA and the Senate still failed to act, we asked our supporters to tweet at Senate Majority Leader Mitch McConnell to urge him to take swift action on bringing the CAA up for a vote. On May 24, 2018, the Senate unanimously passed the CAA. Read our statement on the passage of the Congressional Accountability Reform Act earlier this year. Just a week later, Purple Campaign President Ally Coll then asked federal lawmakers to turn to addressing the issue of sexual harassment across American workplaces. Read what Purple Campaign President Ally Coll thinks should be next on Congress’s #MeToo agenda. In September, Purple Campaign President Ally Coll joined six other former congressional staffers, who have come forward about experiencing sexual harassment while they worked in Congress, in asking lawmakers to finalize Congress’s sexual harassment bill during the lame-duck session. Read their letter to Congressional leadership here. For additional press coverage regarding the letter, please visit our press page. 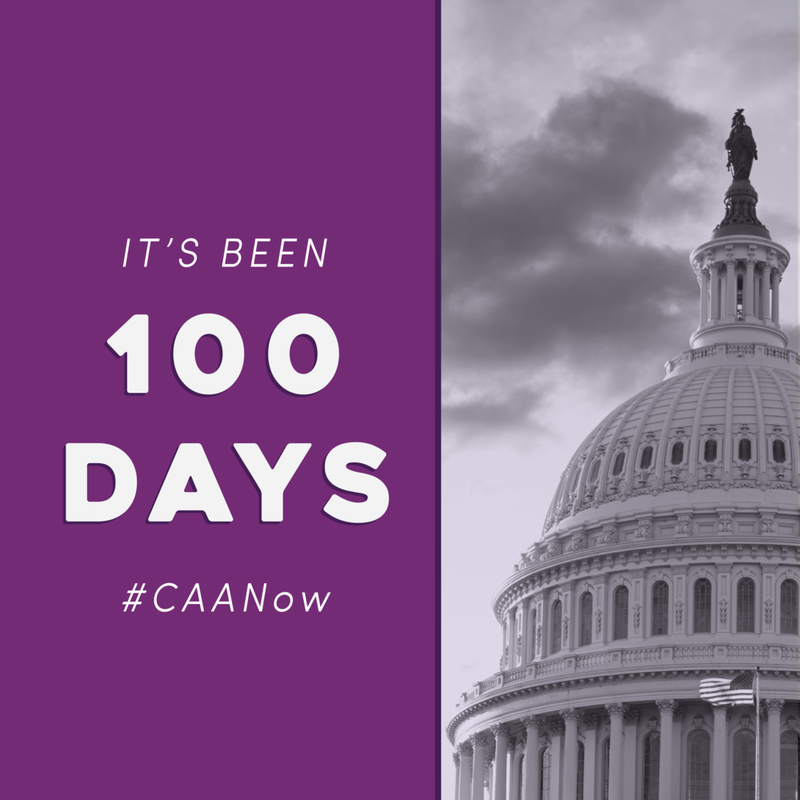 In November, on the one-year anniversary of the Congress Too letter, Purple Campaign President Ally Coll co-signed a letter to House and Senate leadership, urging them to pass the CAA during the lame-duck session. Read the full letter here. During the lame-duck session, we asked our supporters to help push the CAA over the finish line by tweeting at lead negotiators in the House and Senate to enact sexual harassment reform before the end of the 115th Congress. 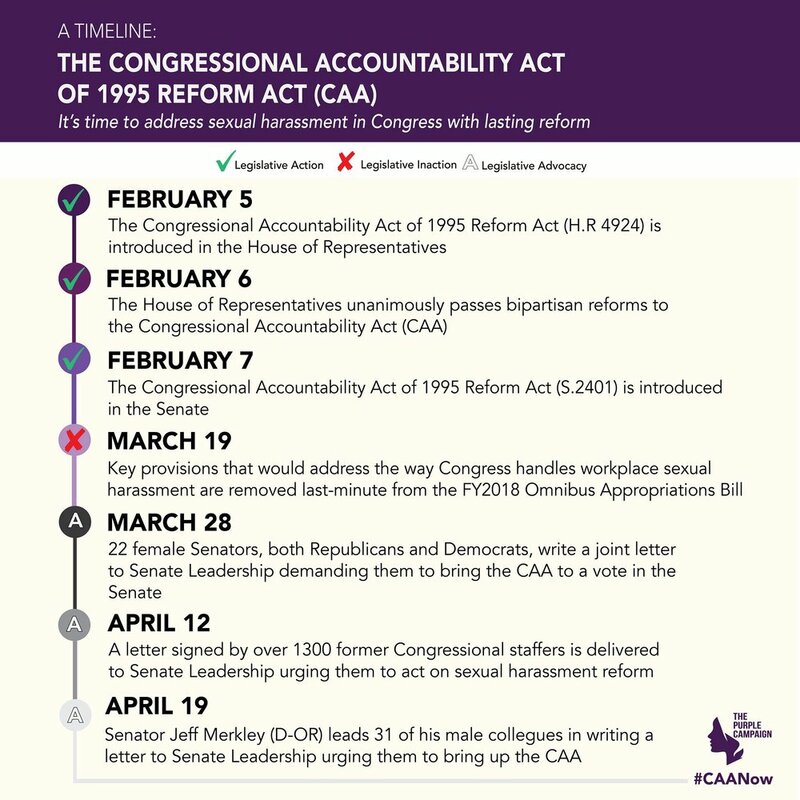 On December 13, 2018, Congress enacted the CAA, making long overdue changes to the way its handles sexual harassment for the first time in over 20-years. The Purple Campaign was proud to see the bill pushed over the finish line before the end of the 115th Congress and signed into law by the President on December 21, 2018. Read the Purple Campaign and Congress Too’s joint statement on the passage of the CAA. 1) To wear black; 2) to wear a red pin in honor of Recy Taylor ; or 3) to bring a guest who would raise awareness about sexual harassment. Members of Congress answered our call to action by using their leadership to raise critical awareness for the systemic problem of workplace sexual harassment. Nearly 46 million people tuned in to watch the State of the Union address. By wearing black, wearing a red pin in honor of Recy Taylor, and bringing a guest, lawmakers gave the #MeToo movement the national spotlight, further giving it the recognition it deserves in this national conversation. We've organized a letter campaign to spread the word about the Purple Campaign’s mission and ask people to #PledgePurple and commit to taking action to end workplace sexual harassment.